Back in the day when a cowboy joined an outfit he threw down his bedroll in a chuck wagon. When he does that, he gives his loyalty 100% to the outfit. It’s a cowboy thing. If you don’t like the way an outfit is run, you grab your bedroll, pony and ride on down the trail. It was a code established by the rugged pioneers and is just as relevant in today’s world as back then, but I’ve gotten off topic. I’m talking about riding for the “motorcycle” brand. Yesterday marked the 21st Annual Ride to Work Day—it’s a day when thousands of motorcycle enthusiasts across the U.S. ride their motorcycles to work in a show of mutual support and solidarity. Originally created by Motorcycle Consumer News columnist Bob Carpenter in 1992, the event has served as a way to promote motorcycles and rider safety; combining the ride with numerous activities around the country, including charitable events. Many riders don’t need another incentive to ride, but the Ride to Work Day is not just something to talk about, but to participate in. I count myself as one of the thousands of motorcycle riders and enthusiasts across the U.S., so I was up early and headed to the ‘plant’ which in of itself is a rare occurrence since I work remote most days. Sure, I exposed myself to the situation where someone doesn’t obey the rules of the road… like that beat up Toyota mini-van which made an abrupt 2-lane change as they entered onto Highway 217. The cars were slamming on brakes which was a little concerning, but not nearly as bad as the dude in the well-worn Ford Escape that cut me off on Highway 26. His NO SIGNAL lane-change was so close that I thought about asking if he’d check my front tire pressure! Or how about on the way home the lady in the Red Mazda – yeah you – with heavily tinted windows so preoccupied with her cell phone texting that she nearly rear-ended the car in front of her. 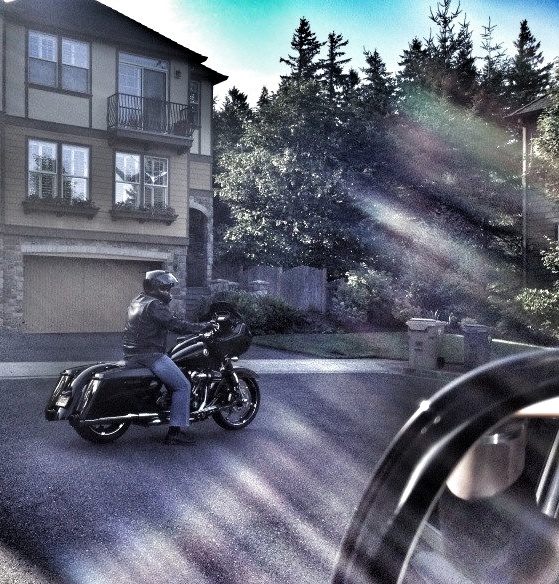 I’ve blogged at length about distracted driving in Oregon and how it’s the norm rather than exception and can honestly say that after being on the road in rush hour traffic I was not inspired, but if nothing else I was there in a “show of force” saying I rode to work today! It was not only an opportunity to raise awareness about motorcycles, but it also provided me a chance to talk about road safety. I would think that two-wheel transportation is part of that “system” and the absence of visible support is odd given Oregon’s home-grown, Brammo that manufactures electric motorcycles in Ashland, and it’s perplexing given that Senators Ron Wyden and Representative Greg Walden worked to get a tax credit extension for Brammo. One has to ask if we have the right group of individuals at the transportation table at the beginning of the process to define the problem and solution together?